Acrylic paint | Welcome to my blog! After weeks and weeks of thinking and planning I have finally produced my final piece for Art GCSE. 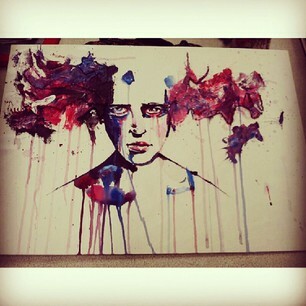 It’s my own adaptation of Agnes Cecile’s acrylic painting. She used oil and acrylic while I stuck with just using acrylic on canvas. To make the painting a little more 3D I stuck cute little colourful beads on the person’s wild, mad ‘hair’. It adds a nice texture to the painting.